Biomedical engineers at Heriot-Watt University in Edinburgh, Scotland, U.K. and the company Roslin Cellab also near Edinburgh developed a lab technique with ink-jet printing to build human embryonic stem cells. The team led by Heriot-Watt professor Will Wenmiao Shu published its findings yesterday in the journal Biofabrication (available free with regisration for 30 days). While three dimensional printing technology has been harnessed to create human tissue cultures, Shu and colleagues believe this is the first time fragile embryonic stem cells have been produced with this technique. The researchers used a valve-based ink-jet printer to apply successive layers of bioinks to produce the cells. The team created programmable patterns with two different bioinks applied and controlled independently layer by layer. The researchers report keeping the print amounts as low as two nanoliters, or two billions of a liter, and fewer than five cells per application. 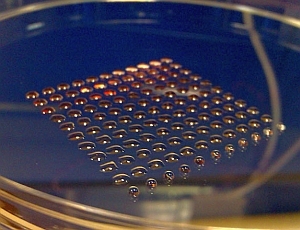 The team then inverted the array of cell droplets to collect and form into spheres through gravity (pictured right). Shu and colleagues were able to produce spheres from 0.25 to 0.60 millimeters in diameter with 5 to 140 cells each that remained viable and pluripotent, which means they can develop further into human tissue. As important, say the researchers, the technology allows for production of stem cells in controllable and repeatable sizes, making it possible to produce stem cells made-to-order. Roslin Cellab is a commercial company wholly owned by the Roslin Foundation that develops products and services for the stem cell research. The company says it plans to use the technology to develop liver tissue for pharmaceutical testing.